I’d had a craving for wings for a few days, so last night at 11:30, we went to Carolina Ale House, whose wings were voted the winner according to Indy Week’s Best of the Triangle (also, every Wednesday, Carolina Ale House has a special of $2.50 for all drafts, which is what caught Sidney’s attention). We arrived at what I imagined to be a pretty typical bar scene, with (drunk) karaoke on the patio and people shooting pool and generally walking around indoors. The restaurant is quite spacey, so it didn’t feel crowded. We seated ourselves at a corner table to avoid the loud music, but the waiters still found us pretty quickly. We ordered the wings, which they offered in several flavors: teriyaki, honey BBQ, buffalo, honey buffalo, and spicy habanero. The honey buffalo sounded tempting, but I decided to go with the original buffalo. The big surprise was how large each wing was! On the menu, they were called “Jumbo Chicken Wings,” but I had thought that was just a name. Now I know why they’re “jumbo”! 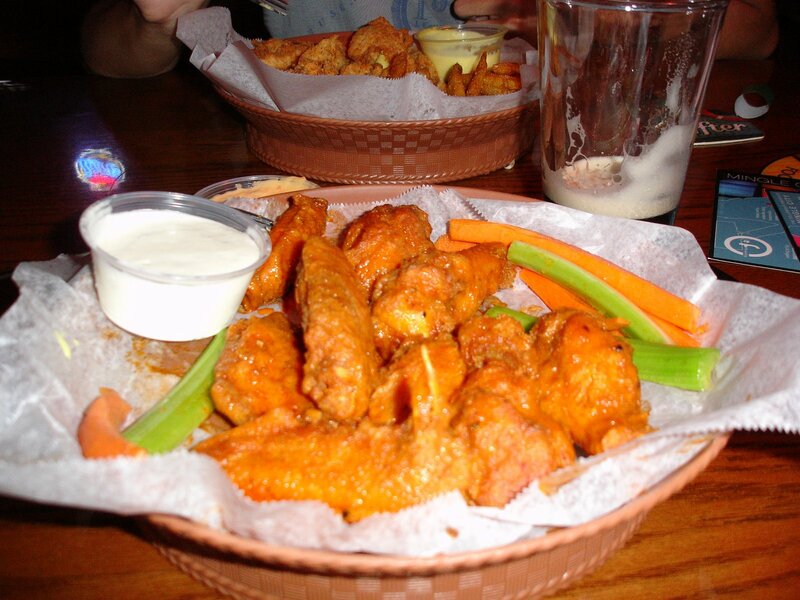 The wings were completely satisfying – I happily finished my whole tray quickly and licked my fingers at the end. It was an awesome experience, and I’ll definitely be back for more – perhaps to try the honey buffalo next time. – Definitely a worthwile appetizer for your meal or a great late-night snack!